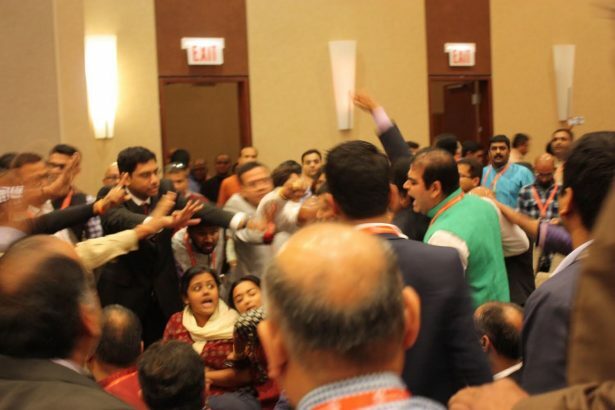 Protesters were attacked at a gathering by an influential Hindu organization that aims to normalize the politics of India’s far right in the United States. 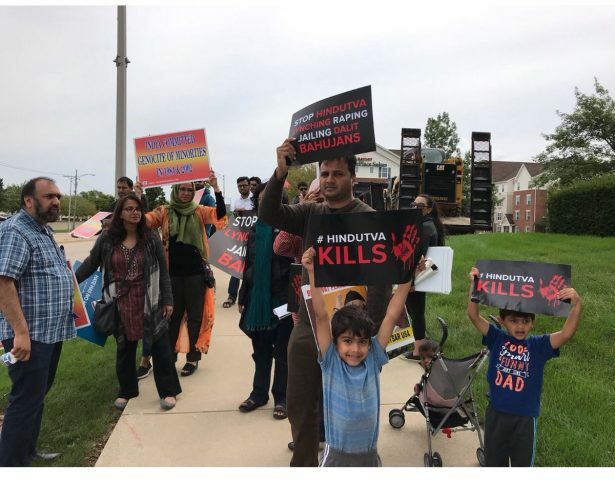 On Sept. 7, a coalition of South Asian organizations mobilized outside and inside the Lombard Westin Hotel, just west of Chicago, to disrupt the the World Hindu Congress, an influential forum that brings together governments, heads of corporations and religious leaders, using religious language to normalize fascism. The Alliance for Justice and Accountability spearheaded this inter-caste and interfaith convergence of activists from groups across the country, including the South Asia Solidarity Initiative and Chicago South Asians for Social Justice. The World Hindu Congress, or WHC, professes an agenda of religious acceptance and “Hindu unity,” but this rhetoric is a thinly-veiled attempt to normalize the politics of India’s far right within the American mainstream. Dalit, Muslim, Kashmiri and other organizations representing oppressed communities throughout South Asia have long been attuned to the Hindu right’s dog whistles and blatant calls for ethno-religious massacres, in addition to their defense of rigid social hierarchy. As the WHC came together for its second conference, organizers refused to let this agenda go unchallenged. The events on Sept. 7 came to a head during the closing plenary in the Westin’s main ballroom, where around a thousand people had assembled. Demonstrators slipped in with the intention of silencing Mohan Rao Bhagwat, the head of Rashstriya Swayansevak Sangh, or RSS — India’s most powerful Hindu right institution. The audience had been engrossed in nationalist speeches about a new age in which the “sun would always rise over” India for the better part of an hour. When they heard chants of “RSS, turn around! We don’t want you in our town!” they transformed into a violent mob. Demonstrators said they were kicked and choked. Encircled by angry attendees, two women who were part of the protest had their banner ripped away before they could unfurl it. They were dragged out before being handed over to the police. One of the conference attendees received a battery charge for spitting on them. According to a statement released by Chicago South Asians for Justice, conference goers called one of these women a “dirty Muslim” and made death threats. The Alliance for Justice and Accountability, or AJA, released footage of the WHC mob online — in addition to a compilation of clips detailing more Hindutva threats and violence. After that uproar, WHC organizers tightened security and called upon Lombard’s police force to drive protesters away from the hotel. Protests continued regardless of these efforts. Demonstrators from Muslim organizations, Sikhs decrying the Indian government’s atrocities against their community, and Kashmiris demanding an end to India’s occupation of their home joined the demonstrations outside of the Westin, moving in a circuit around the building and parading through Lombard. The primary organizer of the WHC was the Vishwa Hindu Parishad, or VHP. Originating in India, the VHP is an ardent proponent of Hindutva. Hindutvatis are culpable in the massacres of Muslim, Bahujan and Dalit communities. The VHP itself has been connected to armed religious vigilantes. Indeed, the organization’s late president, Ashok Singhal, was notorious for praising the 2002 massacre of Muslims in Gujarat. Hailing the riots — which killed more than 2,000 people — as a successful “experiment,” Singhal went on to advocate their replication. The weekend of conference, the WHC renamed the Westin’s main ballroom after Singhal and used the space to hold its largest plenaries. Political speakers from the U.S. establishment who were invited to speak at the WHC ran the gamut from left to right. Several progressive Democrats who had been invited to attend the conference eventually backed out after being targeted by an AJA letter-writing campaign. “Do I think all attendees were Hindu Nationalists?” AJA organizer Ashwin Khobragade asked. “No, I think that many of the attendees are looking to use their faith as a platform to give back to their communities.” There were many community service organization that also attended the gathering. At the same time, those in AJA believe it is imperative to push back against what it identifies as a move to co-opt well-meaning organizations into a fascist agenda. “We wouldn’t want people with social justice values sitting down with people who are like Richard Spencer,” Khobragade explained. Among the politicians who declined an invitation was Hawaii Rep. Tulsi Gabbard, an icon of Bernie Sanders Democrats, who cited “ethical” concerns with “partisan Indian politicians” on the speakers list. Gabbard has been known to be an admirer of Indian Prime Minister Narendra Modi, who has been accused of being linked to the Gujarat genocide and Hindu nationalism more broadly. She has also come under scrutiny for other relationships with the far right and her support for the regime of Bashar Assad in Syria. Congressman Raja Krishnamoorthi, another progressive Democrat, also became the focus of AJA’s accountability letters. Unlike Chicago State Senator-elect Ram Villavam and Alderman Ameya Pawar, Krishnamoorthi has not disavowed the WHC. He has continued to insist that the gathering promotes “acceptance,” despite the links to the far right that protesters have elucidated. Opponents of the Hindu right began organizing their resistance far in advance of the WHC. The AJA extensively researched the conference, its speakers list and its attendees. CEOs, government officials and even the Dalai Lama were among the VIPs. Identifying key attendees was crucial to the aforementioned letter-writing campaign. On Sept. 4, AJA announced that this effort had prompted the withdrawal of delegates from India’s ruling Bharatiya Janata Party — the political wing of the RSS. The goal of AJA’s investigative approach has been to prevent progressives from being co-opted into the vast network of Hindutva organizations that have been working for decades to guarantee the supremacy of dominant-caste (also known as “upper-caste”) Hindus. The RSS, which was founded in 1925, boasts large volunteer and paramilitary sections, and was inspired by the Nazi party and had connections to Mussolini’s fascists. The RSS founded the BJP as its political wing in 1951 and the VHP as a cultural organization in 1964. In an effort to carefully cultivate a more benign profile, Hinduvatis and their sympathizers have obscured this history. For instance, the American branch of the VHP includes commitments to providing community service and bridging faith communities in its mission statement. Yet this pretense of moderation has helped spread far-right militancy among Hindu American diaspora leadership. Organizers from Chicago South Asians for Social Justice noted that WHC speakers used eugenic language. During the closing plenary, one speaker, framing racial science in religious language, exhorted Hindus to have bigger families due to a supposed decline in Hindu births relative to Muslims. Historian Maia Ramnath, who is a member of an AJA ally group known as the South Asia Solidarity Initiative, argues that the right-wing militancy that drives these groups originates from a politics of “wounded egos” and “victim consciousness” among members of dominant-caste power structures. The closing plenary speeches overflowed with resentment and were obsessed with a mythic homeland that had been overrun by the British, Islam and Christianity. Ramnath says this forms a distinctive part of their ideology of racial supremacy, which extols caste and religious hierarchies that became more rigid as they adapted to colonial rule by Britain. “Their logic is that they are supposed to have been supreme,” she said, “but the colonialists denied [them] this rightful supremacy. They will now exercise that supremacy over their so-called inferiors,” such as the Dalits, Adivasis (India’s indigenous people), Muslims and other minority communities. Ramnath despairs of a “stubborn myopia” among Western progressives and anti-fascists when it comes to confronting these groups. She argues that today’s anti-fascist movement does not see how Hindutva emerged from the racism of colonialism, which is an observation that has been made since the resistance to fascism in the 1920s and ‘30s. South Asian diaspora progressives also suffer from blind spots that enable them to decry Donald Trump yet continue to support Narendra Modi. Trump, who has praised fascists, has repeatedly celebrated Modi. Prior to his election in 2016, Trump attended an event billed as a fundraiser for Kashmiri Pandits, a dominant-caste community used as a political football by the Hindu right. Ramnath says this illustrates a problem that coalitions like the one spearheaded by AJA are forced to contend with. The far right is having a much easier time, in her opinion, organizing transnationally than its progressive opponents. What follows in the wake of the WHC protests remains unclear, especially after the attacks on organizers. What is abundantly apparent, however, is that AJA and its allies helped unveil political affiliations that the VHP would rather remain hidden from American political discourse. Whatever concrete steps AJA take next, they are sure to use that footage against attempts to normalize Hindu fascism in the United States. Wow, I had no idea this happened – thanks for writing this informative piece! AJA’s role is exaggerated here. We are aware that the organization that led the push against WHC since the last six months has been the Coalition to Defend Constitution and Democracy. AJA jumped on the bandwagon two weeks before the WHC event, and now will not even acknowledge the work of others in this struggle? Pathetic sectarianism of the worst kind! Wow. This is wildly uninformed. It’s bizarre that you believe that such a mobilization of grps from across the country, plus campaigns with local grps and multiple sites of actions could be organized and achieved in “two weeks”. Of course CDCD should be applauded for the statement they put out, but they were not part of these actions ~ which included many grps as already stated.